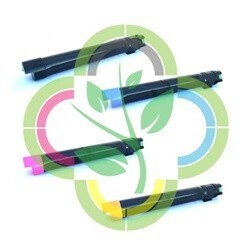 TonerGreen Offers Eco-Friendly Xerox Phaser 7500 Toner Cartridges | TonerGreen - Eco-Friendly Toners from the U.S. Among its extensive collection eco-friendly toner cartridges is the Xerox Phaser 7500 Toner Cartridges Set: Xerox 106R01439, 106R01436, 106R01437, 106R01438 black, cyan, magenta and yellow toners available for the price of ($540.00). Our Xerox Phaser 7500 Toner Cartridges Set offers printer users practical environmental solution, world-class service, and the highest quality toner cartridge set at the most competitive price. Features: Made in USA. 2 Year Warranty. You can experience ultimate Eco-Value when you purchase our Eco-Friendly Xerox 106R01439, 106R01436, 106R01437, 106R01438 - Remanufactured Xerox Phaser 7500 Set of High Yield Black, Cyan, Magenta, Yellow Toner Cartridges: practical environmental solution, world-class service, and the highest quality Toner Cartridge at the most competitive price. Our Xerox Phaser 7500 Set is Eco-Friendly! Remanufactured with up to 75% recycled components, our products are thoroughly engineered to meet or exceed OEM specifications. All our ink and toner cartridges are backed by 100% Risk-Free Guarantee.